Posted 12 June 2017 under Ask Us. It’s not uncommon to have mild skin irritation after using a new skin product for the first time. If your skin continues to be irritated or it gets worse, tell your health care provider. 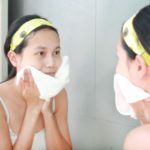 Most HCPs who recommend skin cleansers with benzoyl peroxide usually tell teens to start out slowly, using it 2-3 times a week and gradually working up to every night. Wash and dry your face completely before applying it. You should use a very small amount–about the size of a pencil eraser. It’s common to have red or dry skin at first. If your skin becomes so dry that it peels, your HCP will probably tell you to cut down on the number of days a week that you use it.